The sequel to 2016's Wreck-It Ralph takes Ralph and Vanellope out of the arcade and exposes them to the wild craziness that is the world wide web. Friendships are built on trust, love, and similar interests. Most of us would agree that we’d do anything and go to any lengths to make sure that our friends are happy. Of course, misunderstandings happen. That’s inevitable. Yet when the chips are down and push comes to shove, the best of friends will find a way to make things better and deliver. That, essentially, is at what Ralph Breaks the Internet is all about. Six years after the events of Wreck-It Ralph, Ralph (John C. Reilly) and Vanellope von Schweetz (Sarah Silverman) have settled into a familiar routine at Litwak’s Family Fun Center & Arcade. Although Vanellope still enjoys racing in the arcade game Sugar Rush, she yearns for a new challenge. When big-hearted Ralph wants to give his best friend that challenge, an accident breaks the game. The only way to replace the broken arcade steering wheel is available online and the duo decide to take a chance by jumping onto the Internet. As they explore the vastness of the world wide web, Ralph and Vanellope are exposed to Tweets, searches, the dark web, pop-ups, and other things we often take for granted. At one point, they end up in the dangerous yet exciting game known as Slaughter Race, a game where the enigmatic Shank (Gal Gadot) rules with her gang. Exposed to this new environment, Vanellope is intrigued with the notion of staying, but Ralph isn’t sure if he wants his best friend to leave him and the old arcade. Director Rich Moore returns to the world of Wreck-It Ralph, this time joined as director by Phil Johnston, and take on the challenge of chronicling the next chapter in the lives of Ralph and his crew. Like the movie that preceded it, Ralph Breaks the Internet is a movie overflowing in Easter Eggs due to the massive amount of characters and properties that Walt Disney Animation was able to cram into it. Popular video game characters such as Pac-Man and the ghosts, Q*bert, Sonic the Hedgehog, Ryu, Ken, Chun-Li, and Zangief from Street Fighter, and many more return and are further enhanced by the new world that is the Internet. SELFIE! 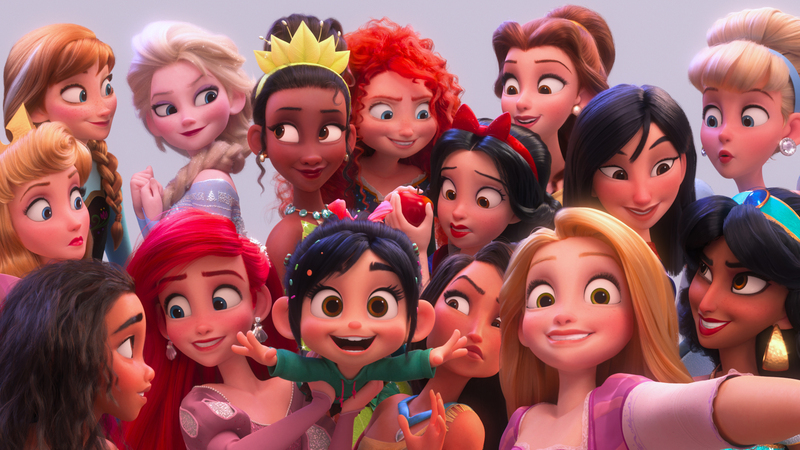 – In “Ralph Breaks the Internet,” Vanellope von Schweetz hits the internet where she encounters and then befriends the Disney princesses. Filmmakers invited the original voice talent to return to the studio to help bring their characters to life, including Sarah Silverman (Vanellope in “Ralph Breaks the Internet”), Auli‘i Cravalho (“Moana”), Kristen Bell (Anna in “Frozen”), Idina Menzel (Elsa in “Frozen”), Kelly MacDonald (Merida in “Brave”), Mandy Moore (Rapunzel in “Tangled”), Anika Noni Rose (Tiana in “The Princess and the Frog”), Ming-Na Wen (“Mulan”), Irene Bedard (“Pocahontas”), Linda Larkin (Jasmine in “Aladdin”), Paige O’Hara (Belle in “Beauty and the Beast”), and Jodi Benson (Ariel in “The Little Mermaid”). ©2018 Disney. All Rights Reserved. That Internet resembles a city with different buildings or pavilions representing each brand, app, or website. It’s staggering how many official sites are present here on top of behemoths like YouTube, Google, Twitter, and Snapchat. As seen in the trailers for this film, Disney was also able to show their many Disney princesses together here. After a change of clothes, long time Disney fans will also appreciate the little details in the princesses’ clothes that are call outs to their individual films and stories. Make no mistake though, for all of those details on the periphery, the star of Ralph Breaks the Internet is the friendship between Ralph and Vanellope. It’s rare for Disney to present a platonic relationship between a male and female character at the center of one of their films. In fact, I don’t recall Disney ever doing it over the course of their 80-year history. Reilly and Silverman really take their voice acting to the next level as their emotional connection to these characters and their friendship are put to its first real test. That friendship is shown as sincere, heartbreaking, and gut-wrenching just as any true friendship should be. To say that Ralph Breaks the Internet is a fun motion picture for kids of all ages might sound cliche, but it is indeed exactly that. In the time-honored Disney tradition, its colors, high-quality animation, and engaging story will keep children glued even as the emotional weight of the story, the layered humor, and the top voice actors will satisfy any adult.